“I am funding the project as my donation to the lodge, therefore all money raised from the sale of the CD will be donated to Lindsey Lodge. To hear some samples from the CD please visit www.linsley.co.uk. Have a listen to the sample tracks and you will hear lovely, expertly played music with a wide appeal. You will be able to buy the CD for £10 (or more if you feel like it) from Adam (the best way because he can give all the money to the Hospice) and in addition digital downloads will be available from Jazzmouse and from iTunes. Adam is selling the CD on eBay as the money can be donated directly to Lindsey Lodge. Please visit www.ebay.co.uk or www.ebay.com and search for "Adam Linsley"
Please add £1.50 p&p for UK, £2.50 for the rest of Europe and £5.00 for the rest of the world. There are many talented Briggensians in many fields of human life: for example in sciences, technology, business, administration... and in the arts. We have often mentioned distinguished painter Professor Peter Welton, a recent edition of the News Page featured poet and novelist John Osborne and Adam himself has appeared here before too. Know of any other Briggensians we should feature? "Unfortunately, you may have heard that we have had to cancel our trip to the UK at the very last minute. We were due to leave today (Sunday 18 January 2009), but after recent medical tests, I have been advised by my Doctor not to fly until such time as I have had several more tests with a Cardiologist here in Perth. I feel fine in myself, but a recent test has revealed an abnormality in my heart, which needs further investigation. With that said, once I have obtained the all clear from the Cardiologist we will be re-scheduling our trip and heading back to ‘sunny’ Lincolnshire. I am currently compiling a DVD, to wish everyone at the re-union a wonderful Australia Day 2009. I am extremely happy to hear that everyone is still meeting up at the Yarborough Hunt on Saturday 31 January 2009 (7.00pm). Our thoughts and wishes will be with you all and we will catch up very soon." Newsletters are in the Library section. 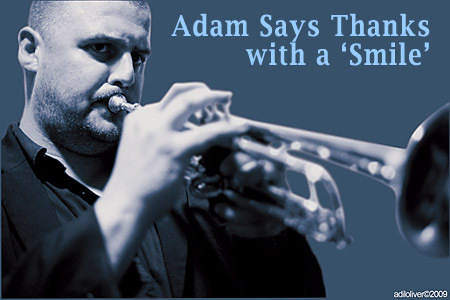 Briggensian jazz trumpet player Adam Linsley has recorded a new CD to raise money for Lindsey Lodge Hospice, Scunthorpe. The recording, entitled "Smile" is due to be released this month.